2nd Saturdays in March, April and May 2019, 3:00 PM. Location: The Historic Pine Grove Community House, in the heart of Manzanita, on the Oregon coast, at 225 Laneda Avenue. This program is free and open to the public. “Black in Oregon 1840-1870” presented by Layne Sawyer, Reference Manager for the Oregon State Archives. Learn about the award winning exhibit produced by the Oregon State Archives staff, interns and volunteers; illuminating the courage and resilience of black pioneers and their families who immigrated to Oregon between 1840 and 1870 despite the many barriers they faced. Introduction by Tom Campbell, President, Nehalem Valley Historical Society. “Surveying Neahkahnie’s Treasure Rocks” presented by Phil Costaggini, researcher, author, and Vice President of the Sir Francis Drake Association of Oregon and California. Learn about the genesis of Phil’s three year journey to produce his thesis: Sir Francis Drake’s Northwest Exploration: An Historical Discussion and Survey of Artifacts at Neahkahnie Mountain. Introduction by Garry Gitzen, author and President of the Sir Francis Drake Association. 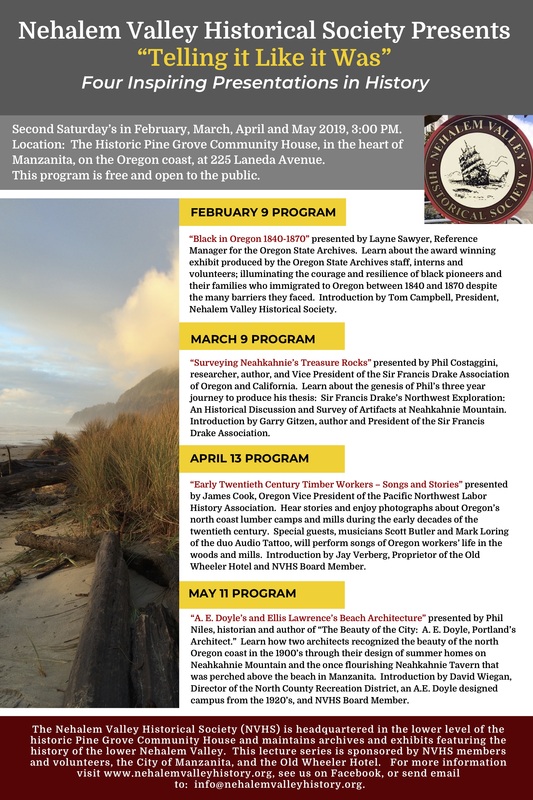 “Early Twentieth Century Timber Workers – Songs and Stories” presented by James Cook, Oregon Vice President of the Pacific Northwest Labor History Association. Hear stories and enjoy photographs about Oregon’s north coast lumber camps and mills during the early decades of the twentieth century. Special guests, musicians Scott Butler and Mark Loring of the duo Audio Tattoo, will perform songs of Oregon workers’ life in the woods and mills. Introduction by Jay Verberg, Proprietor of the Old Wheeler Hotel and NVHS Board Member. “A. E. Doyle’s and Ellis Lawrence’s Beach Architecture” presented by Phil Niles, historian and author of “The Beauty of the City: A. E. Doyle, Portland’s Architect.” Learn how two architects recognized the beauty of the north Oregon coast in the 1900’s through their design of summer homes on Neahkahnie Mountain and the once flourishing Neahkahnie Tavern that was perched above the beach in Manzanita. Introduction by David Wiegan, Director of the North County Recreation District, an A.E. Doyle designed campus from the 1920’s, and NVHS Board Member. The Nehalem Valley Historical Society (NVHS) is headquartered in the lower level of the historic Pine Grove Community House and maintains archives and exhibits featuring the history of the lower Nehalem Valley. This lecture series is sponsored by NVHS members and volunteers, the City of Manzanita, and the Old Wheeler Hotel. For more information visit www.nehalemvalleyhistory.org, see us on Facebook, or send email to: info@nehalemvalleyhistory.org.